A Helping hand to get you Back snugly fitted in your Little Black Dress . 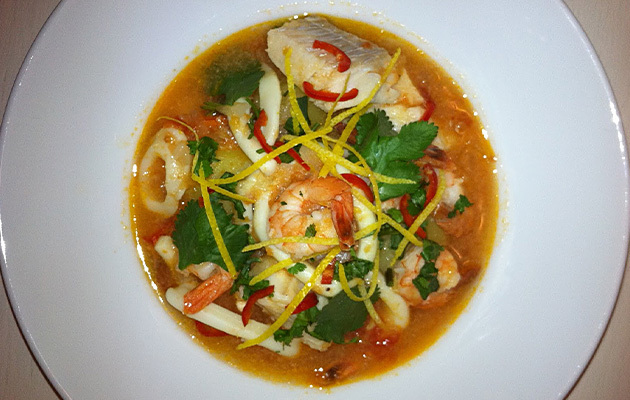 Here is a Fast,Simple yet Delicious Bouillabaisse Style Fish Stew Guaranteed to help, in shedding those extra pounds while clearing your inner temple of sluggishness and that bloated feeling. Now that all the Christmas and New Year's indulgences are well behind us, with only distant and languishing memories, when you've eaten like a Queen and probably worked your way through an extensive list of Fine Wines and Champagne , What better way to Boost Start the New Year with a New You and get toned up. As with all recipes , what you put into it , is going to influence the final dish . So , While you can buy Fish stock cubes these days which although ok ( very high salt content ) , will not give you as good a result as making your own. Fortunately , Fish stock doesn't take long to make and doesn't need hours of brewing and simmering. If you can chat up your Fishmonger ( If he is the handsome rugged type , could be fun!!! , Might be a bit on the smelly side but nothing that a good hose down wouldn't sort out ), plus , he 'll probably give you the Fish bones for free . This stock can be made up to 3 days in advance and keep chilled in the fridge or keep in freezer bags in the freezer until needed. ( up to 3 months ) Warm up before using . Put all ingredients into a large pot , cover completely with cold water and bring to the boil . Reduce to a medium heat and allow to simmer for 20 - 25 mins only , while skimming off any scum or froth. Pass the liquid through a metal sieve or muslin and discard the bones & veg . Allow to cool . Now , that you have this amazing and flavoursome stock, we can get on with the Stew , which is going to taste Fab and get you going back for more. Large handful of chopped Coriander / Parsley or Chives. 1/ Heat oil in a casserole dish , fry onions for 6 - 8 mins on med heat, until soft and translucent. 2/ Add the Tomatoes , stock, bay leaves , lemon zest . Bring to the boil. 3/ Add the Potatoes. Allow to simmer until the potatoes are cooked. Next , add the fish, followed by the prawns & the Squid. 4/ Cook for 2-3 mins or until the Fish is cooked and opaque and the prawns have turned pink. 5/ Season to taste , remove bay leaves and Stir in the Red chilli and fresh Coriander.